“Green gold.” “Future plant.” “World vegetable dromedary.” These are just a few of the terms used for the prickly pear cactus, a humble plant that, according to a new book co-published by the United Nations Food and Agriculture Organization, can serve as a lifesaving crop for many countries, especially those struggling to adapt to climate change. The prickly pear is, as Taguchi says, “amazing” for a few key reasons. First, it’s extremely easy to grow: the flat, spiney cladodes, or pads, of the cactus will grow roots wherever they touch soil, so generating a new crop of cacti is as easy as spreading rows of pads on the ground. It’s also extremely hardy: prickly pears can grow in harsh, arid lands where other plants refuse to grow (as long as temperatures don’t dip below freezing, that is). Second, it barely needs irrigation—and in regions that get at least a little periodic rain, it doesn’t need it at all. Like other cacti, it stores water in its pads, which can be up to 95 percent liquid. It also uses a form of photosynthesis—crassulacean acid metabolism, or CAM—that allows it to shut down during the day, when it’s hottest and the rate of water loss would be highest, and collect carbon dioxide during the night. Because of its low water needs, it’s a plant that can thrive even in drought conditions, when other crops wither and die. That’s good news for regions experiencing more frequent and more intense droughts, because the last amazing thing about the prickly pear is that both the cactus’ pads and its fruits are edible, and make nutritious and water-rich foods for humans and their livestock. A few years ago, for instance, Madagascar was in the midst of a multi-year drought. Crops failed, and many were forced to sell their livestock. But the country narrowly avoided a famine in part because it was able to survive on prickly pear. It’s these life-saving qualities that prompted the UN FAO to spread the word about the prickly pear with the new book, Crop Ecology, Cultivation and Uses of Cactus Pear, co-published by the International Center for Agricultural Research in the Dry Areas (ICARDA), which delves into the spiny plant’s history, ecology, and uses around the world. The FAO hopes the book, which also contains tips for growing cacti crops, will help alert arid regions to the cactus’ potential. The book’s release comes as higher temperatures due to climate change are increasing the risk of severe drought around the world. Years that are hot and dry are more likely to result in extreme droughts than years that are cool and dry, and in some places—like California—climate change is making the hot and dry years more frequent. Luckily, the prickly pear thrives in hot, dry weather, and the cactus can even help facilitate the growth of other plants when it’s planted in regions with dry, degraded soil. The prickly pear is native to Mexico, a country where it’s steeped in culture: The plant is featured on the Mexican flag, and Mexico is one of the few places that regularly eats prickly pear pads—or nopales—as well as the plant’s fruit. The pads are grilled and served in salads, tacos, stir fries and other dishes, while the fruit is typically eaten raw or made into jams, juices, or even gelato. The fruits are water-dense and have a refreshing taste similar to watermelon, Taguchi says, while the pads are slightly bitter with a taste typically compared to green beans. The fruits, according to Taguchi, have more antioxidants than apples and tomatoes, and are rich in flavonoids and vitamin C.
Apart from Mexico, prickly pears are grown in 26 countries, with countries like Morocco and Algeria beginning to grow the plant for its seed extract, which can have cosmetic and medicinal uses. Cacti were spread from Mexico to Europe by the Spanish conquistadors, who—like the cacti-obsessed of today—valued the plant for its decorative purposes. The plant’s popularity is spreading around the world, Taguchi says, and the UN hopes the book will continue to boost prickly pear’s popularity. The prickly pear’s resilience is a rare piece of climate-related good news when it comes to crops. The unpredictable rainfall and temperatures that come with climate change have the potential to disrupt the production of cocoa, coffee, and even corn and wheat. But prickly pear, as well as standing firm in the face of climate change, may even have the potential to help fight it: researchers in Mexico have been looking into ways to turn the cactus’ tough, spiny skin into renewable biogas. Prickly pear, of course, isn’t a miracle crop for everyone: in parts of the world that are getting wetter, for instance, the cactus won’t thrive. And even where it does, other sources of protein and carbohydrates will be necessary for a complete diet. Taguchi says the FAO is looking into a variety of crops, including perennial rices and wheats which could be resilient to different forms of future climate scenarios. Crops that are indigenous to certain regions are also high on their list of priorities, because these crops can tend to be more resilient to climatic changes than introduced crops. 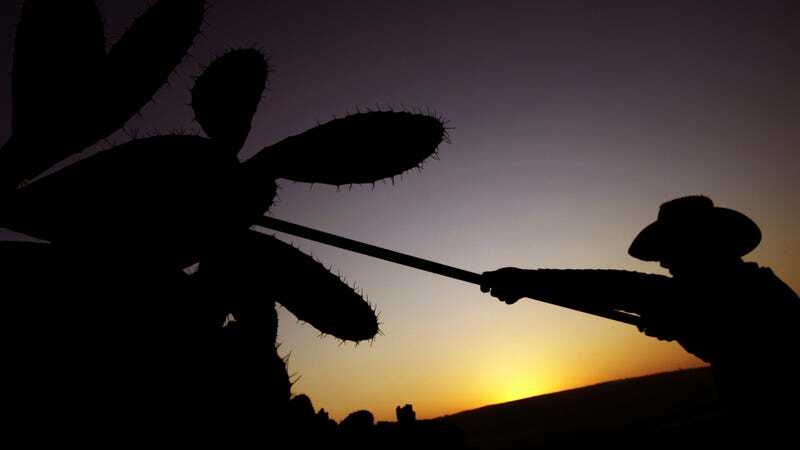 But for those regions where hot and dry is becoming more and more the norm, the FAO is going to continue to press for more prickly pear cultivation.